Back in the day, people would just tie a bandana to a stick and call it luggage. Today, we have smart luggage, which seems like a real improvement until you realize you're not allowed to bring it on a plane. That's becoming more and more the case as more airlines ban and limit passengers' ability to use it. The newest additions to that list are United Airlines, Hawaiian Airlines, and Allegiant Air. 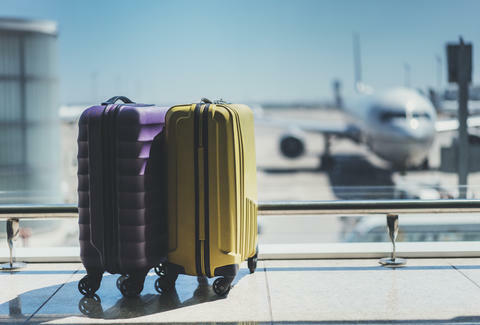 They're joining the likes of Delta Air Lines, Southwest Airlines, American Airlines, and Alaska Airlines, plus international carries like Qantas, Air Canada, and British Airways. The new policies will be enforced starting January 15, 2018. These newfangled bags have features like USB chargers, GPS tracking (no more lost luggage, in theory), Wi-Fi hotspots, and a whole host of other features that make the case that the future is in fact now. The problem is most of these miracles of modern travel use large lithium-ion batteries like the ones used in laptops and cameras. This type of battery is known to overheat and explode, which is not what you want on an airplane. If the batteries are attached to the bag, flight attendants may not be able to remove them in time to prevent damage to the plane. If the bags are checked and in the cargo hold, there would be almost no way to prevent damage. The good news is that bags with removable, easily accessible batteries will still be allowed on flights. You'll just have to remove the battery and keep it in the cabin, away from flammable objects. We're sure you can handle that. If you're going to upgrade, make sure to get one with a removable battery. If not, there's always the good ol' bindle. James Chrisman is a News Writer at Thrillist who is never without his bindle. Send news tips to news@thrillist.com and follow him on Twitter @james_chrisman2.